When it comes to the safety of clients, visitors, and staff, no business can be too careful. At Sure-Foot Industries, we make durable and high-quality products that aim to enhance pedestrian safety indoors and outdoors on a commercial property. Our products are cost-effective and built to last for the long haul. BOLD STEP® metal stair nosings are non-corrosive, attractively designed and will virtually last the life of the building. Our Aluminum Cast Nosings are made from the highest quality aluminum, free from holes or defects. Our uniform quality comes with a natural sand cast finish and a surface of silicon carbide abrasive. These surfaces can be cleaned using a general purpose industrial floor cleaner or swept to remove and loosen dirt. They can also be cleaned with a stiff bristle brush or sprayed up to 1000 psi. 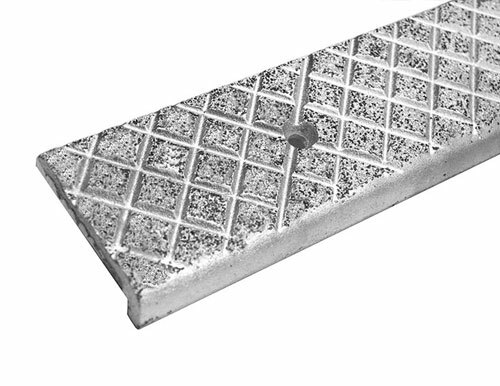 Our cast aluminum stair nosings can be installed as concrete is poured during new construction or retroactively as a safety measure on an existing stairwell or staircase. Our standard depths include 3″ and 4″ and the thickness is 1/4″. The standard lengths of the cast aluminum stair treads are 36″, 48″ and 60″. We can create custom lengths as well. The grit on the nosings is evenly distributed and the cross-hatch etchings allow for a consistent tread. We’ve created our cast aluminum stair nosings and treads with durability in mind. Our products should last for as long as the stairs onto which they’re installed. 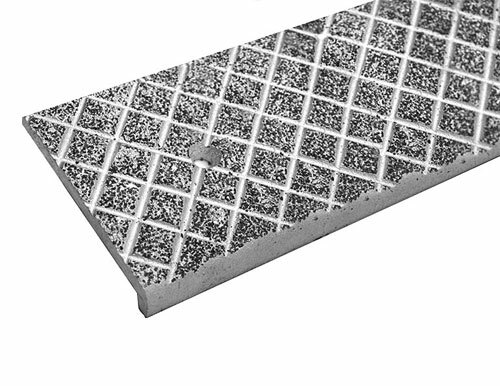 Even when the stair nosings are set into the concrete as it is cast, the nosings are designed to last for a lifetime. The grit on our aluminum does not scrape off and the aluminum will not warp, bend or rust. These nosings work well indoors and outdoors. Any business seeking to create a safer environment should contact us to learn more about our cast aluminum stair nosings. We’re happy to explain the technical details of our products and answer any questions. Contact us to speak with a representative to learn more about our cast aluminum stair treads!